Is Mitt Romney Rising Or Falling In Ohio? At yesterday’s Ohio State home game a Mitt Romney for President blimp circled Ohio Stadium and its vast tailgating areas and drew lots of comments from people favoring and opposing the Republican candidate. It’s the first time I’ve seen a presidential campaign blimp at an OSU game. 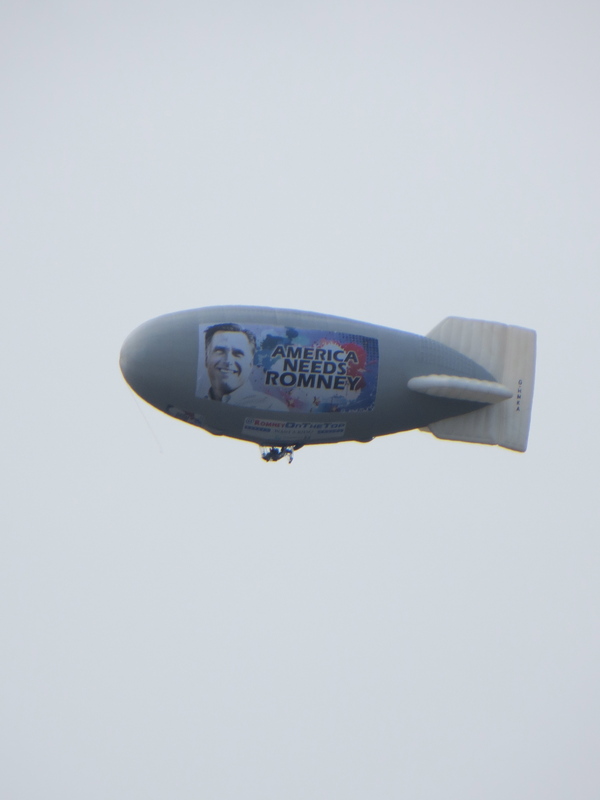 The blimp is an apt metaphor for the overriding question about Battleground Ohio: is Mitt Romney rising, or deflating? As always seems to be the case in this unpredictable swing state, the signs are decidedly mixed. Romney held a huge rally Friday night north of Cincinnati, attracting thousands of people who patiently stood outside listening to speeches on a cold evening. On the other hand, the final Columbus Dispatch mail poll of Ohio voters, released just this morning, has President Obama up by two points, 50-48. However, that lead is well within the poll’s 2.2 % margin of error and represents a huge comeback for Romney since the last Dispatch poll, taken before the debates, in which Romney trailed by nine points. But, the poll shows that Obama has a huge lead among people who have already voted. On the other hand, the poll is based upon the statements of those who returned it, who represent only 15% of the ballots that were sent out in the first place. Get the picture? It’s whisker-close here in the Buckeye State. My unscientific sense is that the Hurricane Sandy episode helped President Obama stem the Romney momentum that had built since the first debate. One hurricane, however, isn’t going to be decisive. From talking to fans craning their necks at that Romney blimp, I think most people have made up their minds. There may be undecideds ruminating on how to cast their ballot on Tuesday, but the vast majority of Ohioans are ready to be done with this election. That means that the outcome will hinge on turnout, and the “ground games” we’ve heard so much about over the past few months. Not coincidentally, both candidates and their proxies are here today and tomorrow, hoping to whip their supporters into a turnout frenzy. The forecast for Tuesday, incidentally, is for clear skies and temperatures in the 40s — and no storms to discourage people from going to the polls.